Program Description: This program has specific areas of focus for each age group and sports-specific exercises. 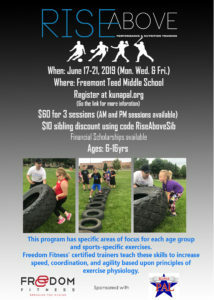 Freedom FitnessÃ?Â¢?? certified trainers teach these skills to increase speed, coordination, and agility based upon principles of exercise physiology.